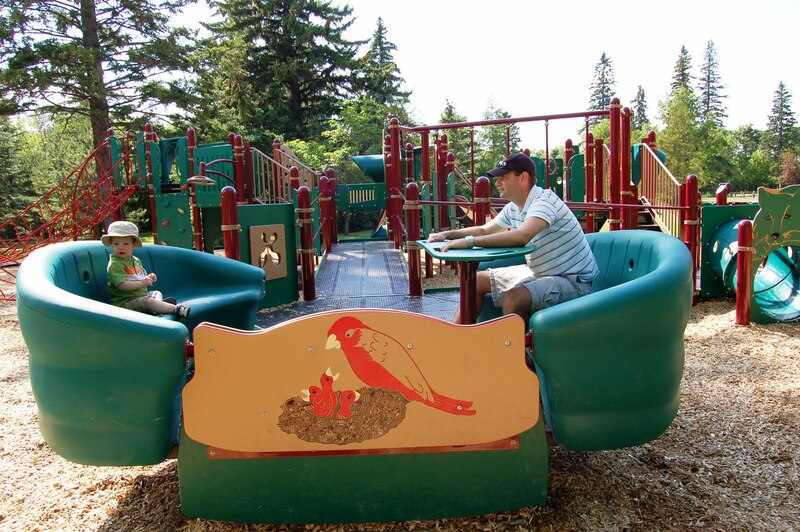 This great playground in the Saskatoon Forestry Farm Park opened in June 2010. The surroundings are gorgeous and the play equipment is second to none. I love that the play unit is also accessible for children with disabilities to enjoy play opportunities while they visit the facility. Much of the play area has a posted age suggestion of 5 to 12. Some of the equipment said it was made for ages two and up. My 19 month old had a blast sliding, crawling and exploring for over an hour under careful supervision. As we left, he felt the need to kiss everything goodbye. 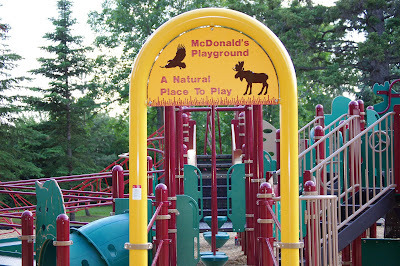 The playground is tucked into the trees and is not visible from the road. To find it, proceed through the park entrance until you get to the butterfly house. Turn right to enter the garden and picnic area. The playground is tucked in at the right before you get to the fish pond. There is nearby parking. Speaking of parking, from May 1 to Sept. 6, a $2 parking/development fee is collected as you drive through the park entrance. Knowing that we will want to visit the park and zoo several times before the summer ends, we purchase a parking pass. The pass is $12 or $10 if you have a zoo membership. Yes, you may certainly meet some overly-friendly mosquitos. We actually marveled at how few there were compared to the golf course we played this morning. Aha! Then we noticed all the fat dragonflies around the nearby fish pond! Go armed with protection, nevertheless! Fantastic! I didn't even know they were making a new park!! Thanks so much for posting this Laura! I loved the slide show too. I look forward to checking out the park very soon. Thanks for all your work on saskmom.com! I have very much appreciated all the information you've shared with us through it! This looks awesome! And if it weren't for you, I would have never known! Thanks for posting and telling us all about it! It is great to know that this is open. I always gave my spare change to Erindale McDonalds for this project. The other playground in the zoo is too advanced for my kids, and I wanted to see a playground more appropriate. This is just another reason to get a season pass to the park! Love the review! I had heard that this was a park to check out. I appreciate you posting photos. Cannot wait to take my children there to play. They will love it! Thanks for the nice comments, ladies! 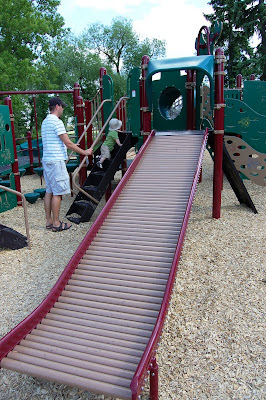 If you like this playground review, you'll love, love the park!